Provides emergency information to Essex County residents before and during any emergency situations such as hurricanes, ice storms and chemical spills. 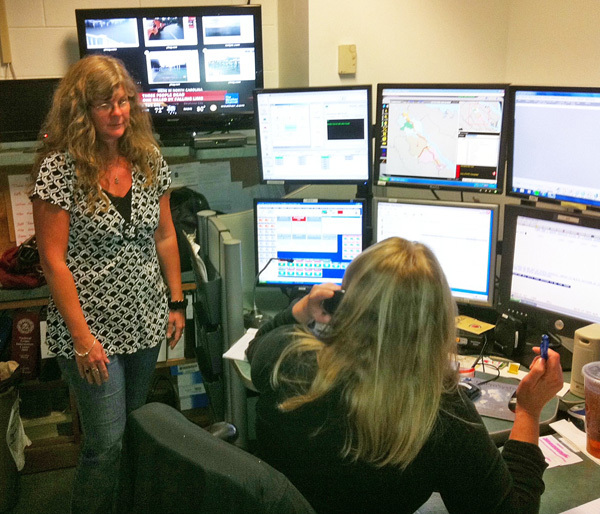 The aim is to communicate to the Essex County community a flow of alerts, updates, annoucements and warnings during periods of disaster preparedness and response. These messages parallel the emergency information broadcast by WRAR and WNNT and provide links to other resources during a disaster. Hurricane Joaquin is now a Category 4 Hurricane but is tracking to the east. Hurricane Joaquin is currently forecasted to weaken and pass off of the coast of Virginia on Monday morning. Flash flooding and river flooding is still expected across the Commonwealth. The NWS has issued a Flash Flood Watch for the majority of eastern Virginia as Joaquin will still impact with winds, additional rain, and coastal flooding. No hurricane watches or warnings have been issued for the Commonwealth. Today: Rain. Rain could be heavy at times. Cloudy, with a high near 61. North wind around 16 mph. Chance of precipitation is 100%. New precipitation amounts between a 1 and 2 inches possible. Tonight: Rain. The rain could be heavy at times. Low around 58. Northeast wind around 22-29 mph. Chance of precipitation is 80% along the coast and 100% in the central area. New precipitation amounts between half and three quarters of an inch possible. National Weather Service Forecast - Joaquin has started to move north, more off shore. As the storm passes Virginia it will be far enough away from our coast line not to cause major damage. Keeping in mind Joaquin has become a very large Cat 4 storm and has become very unpredictable and remember the forecast can change at any time. Essex County next 24 hours: 3-5 inches of rain, heavy at times, minor to moderate flooding, steady winds 30-35 mph. Starting Friday morning through Saturday night we are expected to get 3-6 inches of rain (worse case 7-10 inches of rain), heavy at times, minor to moderate flooding, and winds will be steady at 25-35 mph with gust up to 40 mph. The tides will remain high for the next 3 or 4 days and there may be an increase in the tide level before they start to lower. Governor McAuliffe has declared a state of emergency for all of Virginia. Due to impending weather conditions from two storm systems, Essex County residents in low lying, flood prone area's should be prepared to make appropriate preparations to protect life and property. Heavy rains and high winds are expected with the addition of high tides beginning Thursday evening and possibly continuing thru Saturday evening. You are advised to take precautionary prepardness actions. Stay tuned for further updates as more data is received regarding these two weather systems approaching our area. Like us on Facebook and stay tuned to 105.5 WRAR and 107.5 River Country for updates. Tonight the rain could be heavy at times. Southwest winds 32 to 36 mph, with gusts as high as 55 mph will increase the chance of property damage and power outage. Tomorrow the rain will continue and the wind will diminish. Yet the dangers remain because the ground is saturated and the lower winds can still down trees and cause power outage. Be careful in moving and driving and take all the usual precautions. Portions of Route 17, just north of Tappahannock, in Essex County has water partially blocking the travel lanes. The locations are on Route 17 north at June Parker Marina and Route 17 south at Mt. Landing Creek. There are no plans to close the Downing Bridge. If winds get to 45 miles an hour VDOT will post signs and you cross at your own risk. Sandy is expected to impact our area starting this evening with the peak impact coming Monday and Tuesday. We can expect 3-8 inches of rain with winds 20-30 miles an hour or better with gusts of 40-50 miles per hour. This is a lot of rain in short time and will extend for 3 days. Power outage should be assumed and preparation made. Do this immediately. Those who have secured boats for high water the wind will shift direction late Tuesday and we will experience very low tides. Tides in our immediate area will rise 2 feet above normal. Make previsions for your animals that normally stay outside. Stay tuned to local media and visit Face Book [Essex County Emergency Management] for rapidly changing conditions. In preparation for Hurricane Sandy, Friends of the Rappahannock would like to remind residents to secure hazardous materials and potentially polluting supplies such as fuel, oil, fertilizers on high ground, safe from rainfall and flooding. The Friends of the Rappahannock thank you for doing your part to keep the river clean and beautiful. Due to weather conditions related to Hurricane Sandy, at 11am today the Governor of Virginia declared a state of emergency, and at 4pm today the Director of Emergency Services has declared a State of Emergency for Essex County. Wind speeds 30-40 miles per hour, gusts to over 55 mph, are expected to begin in the area on Saturday afternoon, lasting through through Wednesday. Heavy rain accumulations from 5-7" are anticipated from Saturday through Wednesday; storm surges of 2'  5' can be expected with sustained high water for the duration of the storm. County staff strongly encourages voluntary evacuation of the Lowery's Point, Lowery's Road, Coleman Island, Coleman Island Road, Shellfish Beach, Shellfish Beach Road, River Place and Grand View Beach at the low end and other low-lying areas prone to flooding due to potential accumulations of rainfall and storm surge. Voluntary evacuation of manufactured houses and houses with potential for damage from trees and potential access/egress issues is also strongly recommended. Listen to your local radio station WRAR or WNNT for most current weather conditions as they will have the most pertinent information about local conditions. Residents living in the following areas of Essex County should be preparing to evacuate by Sunday, October 28th at 5pm at the latest...Lowery's Point, Lowery's Road, Coleman Island, Coleman Island Road, Shellfish Beach, Shellfish Beach Road, River Place and Grand View Beach at the low end and other low-lying areas prone to flooding due to potential accumulations of rainfall and storm surge. Voluntary evacuation of manufactured houses and houses with potential for damage from trees and potential access/egress issues is also strongly recommended. Staying in these areas will endanger you and anyone that might have to help you if you get in danger. Essex County residents are encouraged to start preparing now by getting supplies together, medications, cash, food and gas. Prepare for the very real possibility of a power outage. Make arrangements now for the care of the elderly and children. Make a decision now where you will go in case you need to evacuate from your home. All of Essex County's normal routine was disrupted this weekend by Hurricane Irene. Following an Emergency Management briefing on Thursday the county's emergency plan went into operation. County agencies were represented and explained their preparation. A shelter was scheduled to open at 10:00AM on Saturday and it was closed at noon on Sunday under the able leadership of Sue Swann and served 101people. The Emergency Operation Center at the sheriff's office was open on Saturday at 8:00AM. The center is the operational brain for a very diverse group of services to serve Essex in time of emergency. In and out of this center are county leaders and volunteers. Coordinators such as Larry Smith and administrators such as David Whitlow were present most of the time. The center is connected to emergency workers by phone and radio. The center provided coordination for law enforcement, rescue, fire and others. The public was informed of changing events and safety warnings by public information personnel by utilizing the local radio stations. People who work in emergency services are particular critical of themselves in any operation but Larry Smith was pleased with how smoothly the counties response went. Dave Whitlow on Sunday was already into recovery mode making plans for clean up. Irene #15 - THANK YOU COMMUNITY! Essex County Emergency Management Services wishes to thank attitude and performance during this very stressful visit of Hurricane Irene. In particular, EMS wishes to especially thank the Fire and Rescue personnel, Town and County law enforcement, VDOT personnel, Town public works department, Dominion Resources, Rappahannock Electric and Verizon employees, the many State Agencies offering assistance, the people responsible for sheltering residents during the storm, especially WRAR and WNNT for their on-the-air constant support and the personnel of Emergency Management Services and Emergency Operations Center. The outstanding response of all personnel and citizens is a testament to the strength of our community. Essex County Juvenile Domestic Relations court will be closed Monday, August 29. Please contact the clerk's office [804-443-3744] for your new court date. County offices will be closed tomorrow to public business in order to assess damages. The Board of Supervisors will meet in public hearing at 11:00AM to ratify the emergency services organizations for state programs. The Board will also adopt the resolution to declare the Hurricane Irene emergency. There are three National Guard teams and contractors working to clear the county's primary road system [Routes 17 & 360] and the most heavily traveled secondary roads. If you must drive exercise extreme care to avoid these workers and their equipment. The information numbers at the Essex County Emergency Operation Center should be used to report safety issues. This center has no information about power outage, blocked roads or business openings. Essex County Emergency Services will continue to provide a shelter to county residents throughout the night until the end of the storm – some 40 residents have taken advantage of the shelter at Essex intermediate school. It is critical that all residents stay off the roads unless absolutely necessary as there is very high likelihood that your journey will be obstructed due to fallen trees across the roadway. Widespread power outages in both Dominion Virginia Power and Rappahannock Electric areas have been reported with over 60% of customers impacted. Please use the call-back feature to have the power company automatically call you back with an estimate of reconnection. Tomorrow, when the storm has passed, residents of Essex County need to be extremely vigilant and alert to potentially live downed power lines and fallen trees across roadways. If you decide to evacuate from your residence, the EOC highly recommends you disconnect power at the main switch so that reconnection does not cause damage to your property. Essex County Emergency Services alerts all travelers on both major highways and secondary roads to be vigilant of vehicles traveling in the wrong direction in their lane because vehicles are forced to turn around to avoid fallen trees blocking their direction of travel. It is critical that all residents stay off the roads unless absolutely necessary as there is very high likelihood that their journey will be obstructed due to fallen trees across the roadway. Essex County Emergency Services advises travelers that Route 17 Northbound lane is closed at Loretto near the First Baptist Church. All county residents are reminded to stay off the roads unless absolutely necessary as VDOT is only removing fallen trees from Routes 17 & 360, and Essex County Emergency Operation Center is receiving continuous reports of falling trees in the county. Essex County Emergency Services has been notified by VDOT that they will only be clearing fallen trees from Routes 17 & 360. Secondary roads will not be cleared of fallen trees until the storm has receded except in situations where emergency services require access. All county residents are reminded to stay off the roads unless absolutely necessary as the Emergency Operation Center is receiving continuous reports of falling trees in the county. Essex County Emergency Services advises that most businesses on Tappahannock Boulevard, south of Hoskins Creek to Brays Fork have lost power. Business closures due to loss of power include Food Lion, Walmart, Sheetz, Lowe's and all service stations. Essex County Emergency Services advises that flooding is currently taking place. Piers along the Rappahannock River are now under water. We have sustained winds of 30 mph. If you need to contact the Essex County Emergency Operation Center, call 443-4395 or 443-4519 for further information. Residents are encouraged to reserve use of 911 and Sheriff's Department numbers for serious emergencies.